If you have a Twitter account, we have something in common: Daily DM attacks. For those not in the know, direct messages—or DMs—are private messages you can receive from Twitter users that you follow. When I wake up, I find at least three DMs in my Twitter inbox. By noon, I’ve received another four and eight more by the time I turn off the light to sleep. And they’re really annoying to receive. Don’t get me wrong. I love conversing with others online. But the DM is usually not the way to get my attention. Are you a mass DM-er? Keep reading. In the past five years, we social media mavens have been spoiled with great tools that allow us to schedule social messages, track our followers and analyze our audience. There are even tools that allow Twitter users to send out automatic DMs to everyone that follows them. The messages can be sent out right away or timed so that it appears that the message was sent organically. The key word here is automated. That means it’s a generic message sent out to basically everyone that clicks Follow. Sure, it can be customized to my particular interests. I sometimes get DMs about content marketing or creative writing because I’ve tweeted about it in the past. But it’s still a mass message being automatically sent to a group of us. No one likes automated DMs because the message always asks us for a favor. Like your Facebook page. Download your latest eBook. 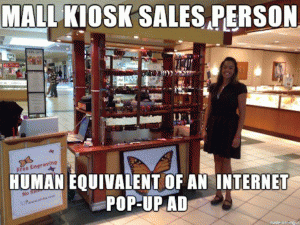 Visit your website. Vote for you in some popularity contest. The purpose of the Twitter DM is to have a private conversation that’s not broadcasted out to the rest of the Twittersphere. That’s the problem with automated Twitter DMs. They’re not authentic. I can see through your automated strategy and trust you less. Now I don’t care about your tweets. Now I don’t want to read about your latest project. Now I roll my eyes when you appear in my newsfeed. This is not the way to start a relationship on Twitter. If you’re trying to increase clicks, reads and follows, then why are you sending it in a private message? Why not make it a tweet to increase the exposure of your goal to be seen? No, it’s not going to make me like it any more than your automated message, but at least, as a marketer, I’d understand your strategy before I unfollow you. I’m not contradicting myself. I think that the DM serves a great purpose for Twitter. It’s just not being used much, if at all. DM me to start a real conversation. Ask me a question not to sell me something but to just learn more about me. And guess what? I’ll want to learn more about you. 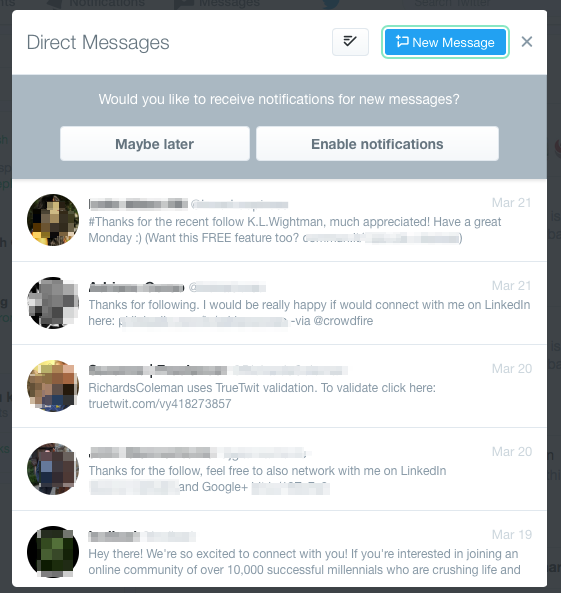 Do you hate automated DMs? Or are you sending out automated DMs? Share your story below. Do Seasons Affect Our Creativity?